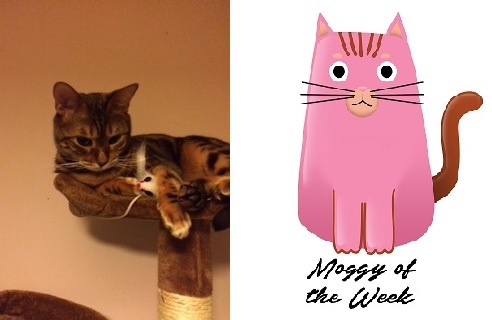 Boscoe is our Moggy of the Week. Being mum to four rescue cats myself, I persuaded the MoggiesandMe team to agree with me that Boscoe deserves to win as he is a real mummy’s boy, according to his mum, Michelle Carroll. She told us: “I took Boscoe and his brother Mr Bojangles in after a friend’s friend said they were too much to cope with, even though they were only 5 months old. They are my world. Boscoe is very much a mummy’s boy. He loves to just sit in the bath or try and find spiders in the garage. He does not like the hoover though. I love coming home from work as he will be waiting by the living room door waiting for me. Boscoe is 8 now but he’ll turn 9 in February, so this Moggy of the Week win is kind of like an early birthday present for him. 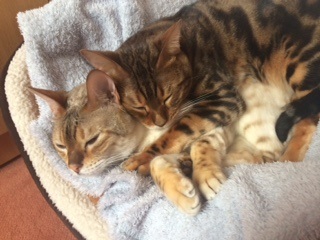 And, just so you know how cute his brother Mr Bojangles is, and how close the two boys are too, here is a wee photo of them cuddling up together while sleeping – awwwwwww.